The use of high preheating temperature raises welding costs due to increased energy use for heating the work, thus people have minimized it by using advanced welding materials featuring better weldability. 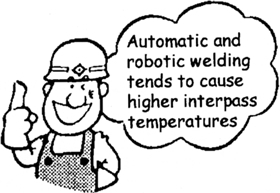 In contrast to this, interpass temperature is apt to be raised in order to fill the welding grooves as fast as possible for better welding efficiency, thus for decreasing welding costs. On the other hand, mechanical properties (as for ferritic steels) and crack resistibility (as for austenitic steels) deteriorate with high interpass temperatures and, in turn, low cooling rates. This is why a maximum interpass temperature often becomes a problem. Figure 1 shows test results of 490 MPa-class GMAW weld metals using solid wires on mechanical properties as a function of interpass temperature (Data source: Steel Construction Engineering, Vol. 7, No. 26, June 2000). 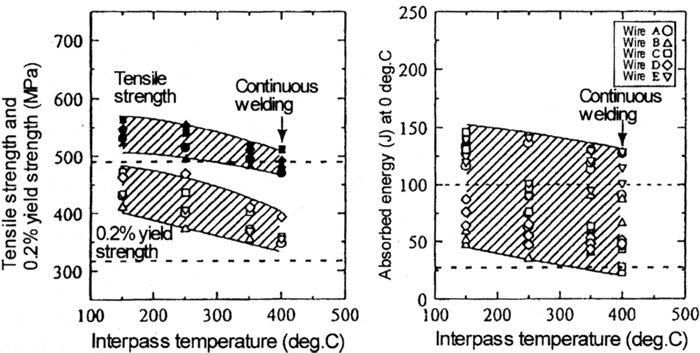 It is obvious in this figure that tensile strength, 0.2% yield strength, and impact energy of the weld metals decrease with high interpass temperatures. Therefore, the interpass temperature must be restricted to ensure the required mechanical properties. The figure suggests that a maximum interpass temperature should be 250°C to ensure 490 MPa of tensile strength. Maximum interpass temperatures of 150°C for austenitic stainless steel and nickel-base alloys, and 70°C for aluminum alloys are generally required to prevent hot cracks.